Brittany Santin of Grand Island, NE was excited when she found out she was expecting again after a miscarriage and fertility treatments. Her family was relieved when they were in the clear for miscarriage and were told the pregnancy looked normal. At Brittany's anatomy scan at 18 weeks, everything was going according to the textbooks. All the measurements were completely normal. Told they would be having a girl, Brittany was thrilled to hear her daughter was measuring a week ahead in development. 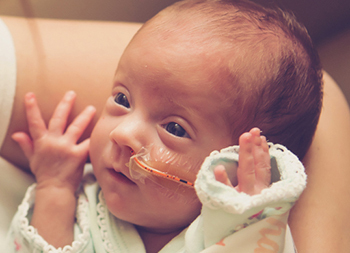 At exactly 22 weeks, Brittany started having some cramping but didn't think anything of it. She just assumed she was overexerting myself. But the cramps did not go away and she lost her mucous plug, She rushed to her obstetrics physician in Grand Island. There she was told that she was already 3cm dilated. I honestly believe our daughter would not be here today if it wasn't for this hospital. The OB office in Grand Island told Brittany they weren't sure if there was anything they could do. They recommended driving to an Omaha hospital to see if they could do a cerclage to get the labor stopped. Brittany drove to Omaha where a cervical cerclage was performed successfully at a local Omaha hospital and she was sent home four days later. The day after arriving home, Brittany went into labor again. When she returned to the Omaha hospital she was 2cm dilated with bulging membranes. She was told to go home and wait for her water to break. The next morning, Brittany made the decision to get a second opinion at Methodist Women’s Hospital Perinatal Center. After meeting with Robert Bonebrake, M.D., maternal-fetal medicine specialist, everyone agreed to aggressively try to delay giving birth. At this point, Brittany was only at 23 weeks in her pregnancy. An infection at 25 weeks forced Brittany to deliver. Named Shaylynn, Brittany's daughter stayed in the Neonatal Intensive Care Unit (NICU) at Methodist Women's Hospital for 77 days. Brittany says, "The nurses and doctors were wonderful. We had (neonatologists) Dr. David Minderman, Dr. Khalid Awad and Dr. Thomas Seidel. We became pretty close with our consistent nurses and still communicate with them today." Today, Brittany says Shaylynn has no medical issues at all and is meeting all her milestones. Brittany truly believes this would not have been possible without the doctors who helped Brittany and Shaylynn face some really tough days. She thanks the doctors for always being optimistic and making decisions they truly believed were for the best, "even when we were nervous and didn't always agree." Brittany says, "I don't know what made us decide to get a second opinion that day when I was in labor, but I am so glad we choose to come to Methodist Women's Hospital. I honestly believe our daughter would not be here today if it wasn't for this hospital."